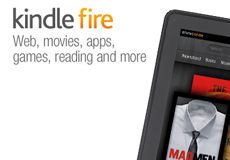 Amazon Purchasing Yap: Possible Siri Rival for the Kindle Fire? In a quiet acquisition deal, Amazon is purchasing Yap, a speech-to-text startup that may find its voice recognition technology in future Kindle products. “Yap is truly a leader in freeform speech recognition and driving innovation in the mobile user experience,” says Paul Grim of SunBridge Partners, which funded Yap in 2008. “Yap’s technology may give Amazon the ability to add voice controls to its tablets capable of understanding far more than the rudimentary commands currently supported by Android software, potentially allowing the company to erode Apple’s dominance,” reports Forbes. Apple has yet to make a move toward installing Siri on its iPad, so Amazon could get a jump start. “If Amazon puts Yap’s technology to good use and releases tablets with intuitive voice recognition in the near future, it may give Android-powered tablets a stronger handhold in the market,” suggests the article.